It’s awesome and funny while being a super fun game to play but I have a problem with events. For me my event never show up on the me on the map and a portal it just breaks the game when I go on and I have to exit the game just to exit the screen which is really annoying! And when I beat the world boss it doesn’t count ever! It’s all just so annoying! Please please please fix this glitch! (By the way it’s just me that this happens to apparently and it didn’t happen last time I had it on this device). When it first released, the game runned smooth as butter, no real issues with it at all. Now in 2019, the game is full of bugs like visuals acting up, weapon blueprints sold when you didn’t buy them, recipes for food items being wrong, audio bugging out, failing to restore purchases. 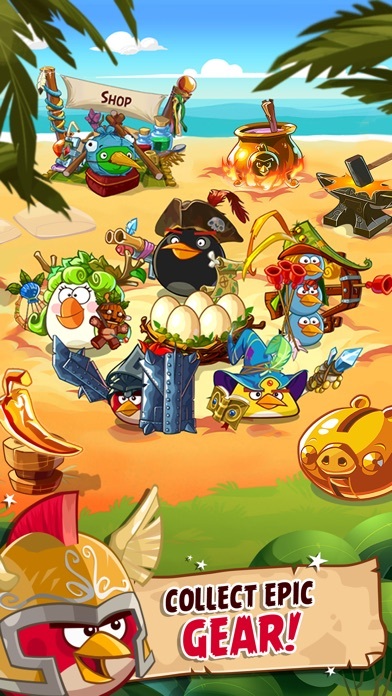 I could keep going with complaints but, the one thing that bothers me the most is that Rovio is doing nothing to fix these issues. I get it, the modern Angry Bird design in games and movies are important to new fans today, but having things for fans to still enjoy from the past is also important. 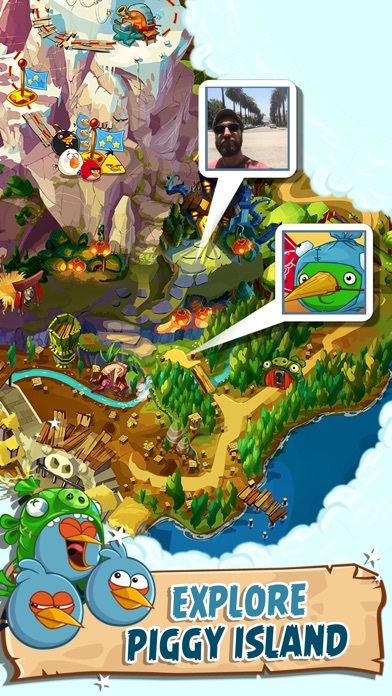 If the developers of Angry Birds are hearing this, please PLEASE fix the problems in this. This is a super great game but I wish you could trade snoutlings for lucky coins. It’s overall a good game. It’s one of the best RPGs I’ve played in a while. The only reason I’m writing this review is because of the ads. I know your trying to make money and all and I don’t have a thing against the amount of ads you have. BUT My 4yr old is playing it right now and I heard an ad with a cuss word in it, so please be more selective of your ads, please, for the sake of my parents finding out and banning it. As a long time player of this game, I have enjoyed a lot about it. Except for one thing: Random difficulty jumps. For example, I’m playing the medium difficulty Slingshot Woods, and then the next area I go to has a high power mini boss(named Stinky Stanley, and I hate him)who I get stuck on for 2 months. Then when I finish him, it goes pack to regular enemy power. I mean, shouldn’t the mini bosses close to the power of other enemies? I mean 10 power above regular enemies should be ok, but not 40! Same with dungeons. 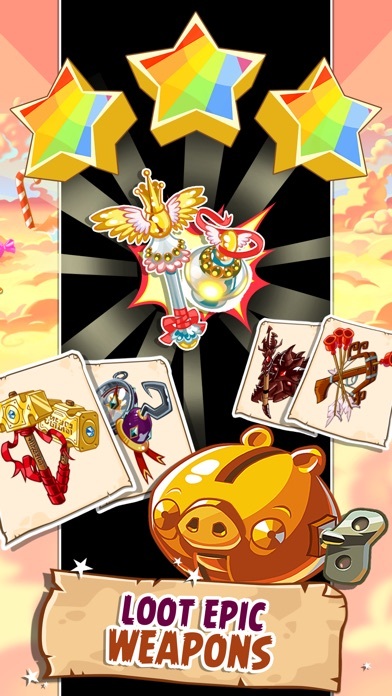 Porktuga is easy, and then the next dungeon, Haunted Ship, is like all heck went lose! Then the 3rd dungeon isn’t that hard. 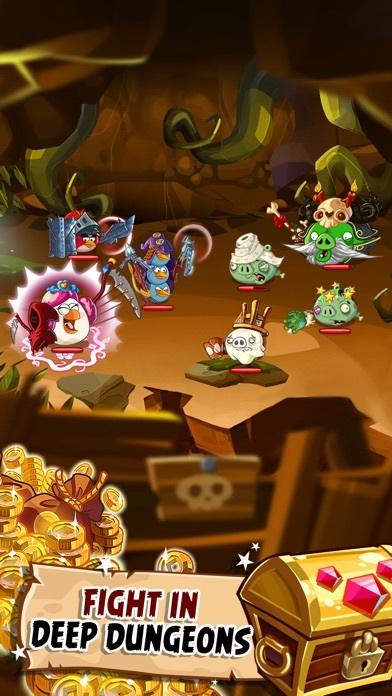 All I’m saying Rovio is that you shouldn’t put HUGE power gaps between mini bosses and regular levels (and don’t forget to do it to the dungeons too! And why is sunken temple a copy of haunted ship?). Bring back the Daily Golden Pig! I played this game about 4 years ago on my tablet and loved it! I remember the daily Golden Pig and loved it so much. It was a great way to get Lucky Coins without buying anything or struggling by leveling up every so often. I got to cave 8 i think in the Chronicle Caves before my Tablet broke. After a few years, I decided to give this game another go on my phone. It was just like how I remember it, with even more events! But then I realized something. The Daily Golden Pig was gone! I was so disappointed, but kept going. I am now on cave 18 in the Chronicle Caves, but now it’s getting really hard and Lucky Coins are hard to come by for me. Please bring the Daily Golden Pig back and I’ll rate this game a 5 star! 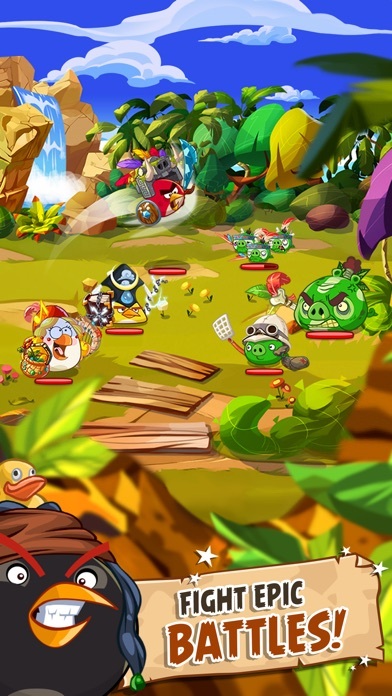 Thank you Rovio and keep up the great work!